What is Midas Hotel & Casino? Mixing glamour, contemporary style, and cutting-edge culture, Midas Hotel and Casino amplifies Manila’s vibrancy with artistic ambiance and local flair. Nestled along the majestic stretch of the city’s famed sunset boulevard, the hotel embraces an atmosphere that is stylishly piquant, making it a place that’s at once an exciting destination and comforting cocoon. Immerse yourself, relax, and revel amid jetsetters, creative types, and design and food enthusiasts in an innovative environment where fashion meets tradition. For your living pleasure, find yourself cushioned by designer furnishings, inspiring patterns, and pleasant natural fabrics in the carefully appointed 225 spacious guest rooms and suites. Unwind and refresh with every comfort and amenity, made all the more soothing and pleasurable with the signature Midas Touch service that’s committed to fulfill all guests’ wishes at any time. 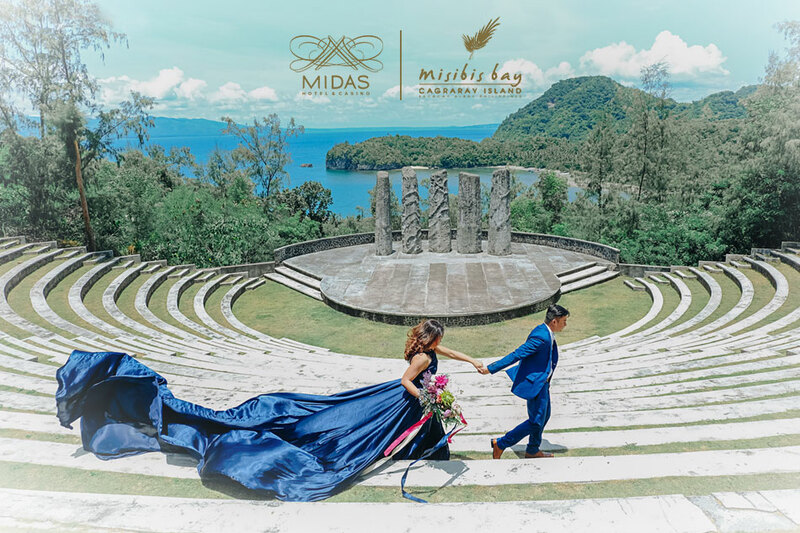 How can I contact Midas Hotel & Casino? How can I send comments regarding my experience with Midas Hotel & Casino? Where is Midas Hotel & Casino located? Does Midas Hotel & Casino have a shuttle service? Yes. We offer scheduled shuttle service to SM Mall of Asia. What time does the reception open? Our reception is open 24/7 and we would be at your service day and night. Can I send a package to one of Midas Hotel & Casinos guests? Yes, but, this will be coursed through with receptionist. Package can be dropped off at the front desk upon confirmation from guest that a package delivery is expected. Can I bring my pet in Midas Hotel & Casino? For safety and security purposes, we do not allow pets into the hotel and casino. Is there Wi-Fi in Midas Hotel & Casino? Wi-Fi is available in the hotel & casino. Will my online reservation information be secure? Absolutely. We value your privacy by maintaining your confidential information on a secured server that no one else, except you, is authorized to use. How can I reserve a room? You will be able to find the “BOOK NOW” button on the top right corner of our homepage. After clicking, you will be redirected to another page where you will be able to see a list of room types and rates and you will need to enter your check-in/out dates, special requests, and personal information. 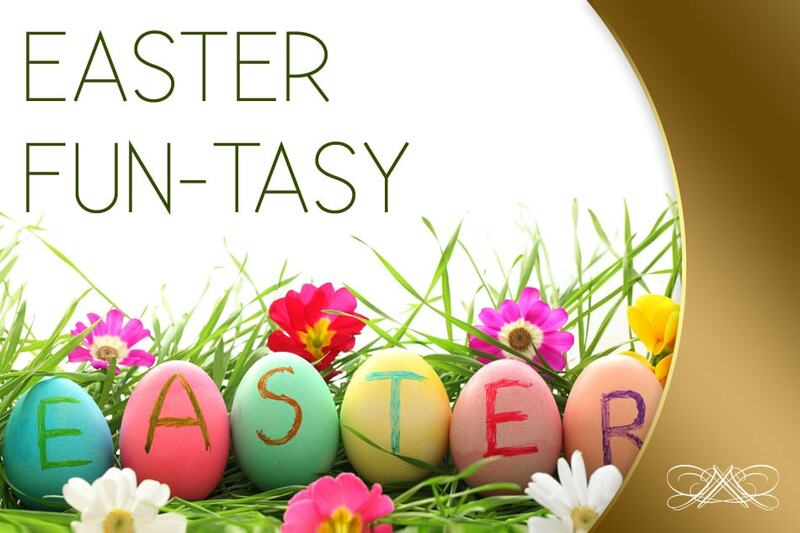 Your reservation can then be completed in a few quick steps. How can I see all the rooms I reserved? For every page, you will be able to click the “MANAGE ROOMS” button to display the booking summary of rooms. You will also be able to see it at the “TOTAL CHARGES” tab. As soon as you are redirected to the booking page, you will have an option to add as much rooms as needed. However, you will be notified if you’ll be needing to add more rooms based on the maximum allowed limit of guests per room availed. What is the minimum age required to check-in/make a booking? For safety and security purposes, the minimum age required to check-in/make a booking is 18 years old. Why should I confirm my reservation online instead of walking in? By making a confirmed reservation, you will be ensured of having a room once you get to the hotel. This means that we will hold your room until check-out time the day following your scheduled arrival. In the event you do not check-in, the hotel will charge your credit card per the rules of the rate you reserved. Why do you need the number of adults, number of children, and my children’s ages? This is for safety and security purposes. Our website will automatically indicate whether or not your rooms are enough to accommodate your party based on the maximum allowed per room. Can I book multiple rooms with different number of guests and/or children’s ages? Absolutely! But please be guided accordingly regarding the maximum allowed number of adult and child guests per room being reserved. How do I find my corporate rate? To find out if your company has special corporate rates in Midas Hotel & Casino, you have to call the hotel directly to make reservations. By providing your credit card details as a form of payment at the time you make your reservation, your room reservation will be considered guaranteed. This means that we will hold your room until check-out time the day following your scheduled arrival. In the event you do not check-in, the hotel will charge your credit card per the rules of the rate you reserved. This is to ensure that your booking doesn’t get mixed up with other bookings with the same name. How can I confirm that my reservation has been made? An email will be sent to you as soon as you confirm your reservation by providing a down-payment via credit card. Why didn’t I receive a confirmation email after confirming my reservation? The confirmation email is usually sent automatically as soon as you book your reservation but, if there should be an instance of a delay, it will probably be in your inbox within the next 24 hours prior to booking. You could also check your “JUNK/SPAM” mail in case of previously made settings to your email account. 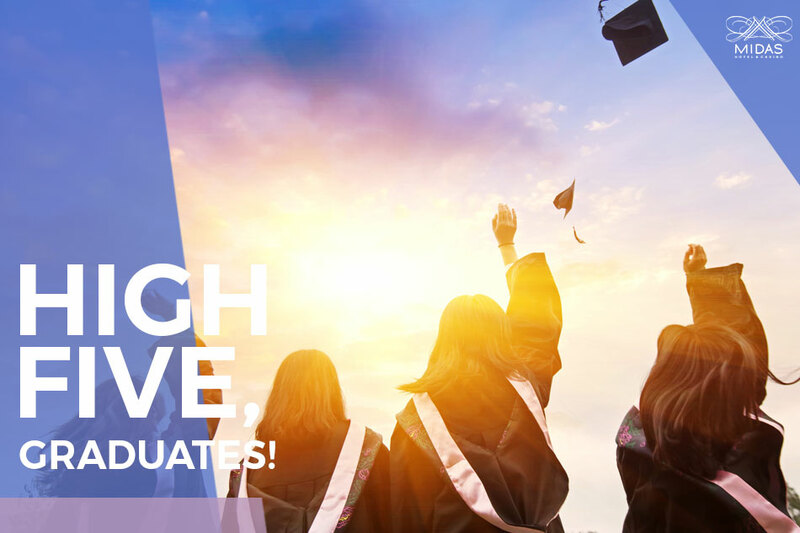 However, if a confirmation email still hasn’t been sent but your credit card has been deducted the stated down-payment amount, please contact us regarding this matter. Why do I need to make a prepaid online deposit? By making a prepaid online deposit, your room reservation will be considered guaranteed. This means that we will hold your room until check-out time the day following your scheduled arrival. In the event you do not check-in, the hotel will charge your credit card per the rules of the rate you reserved. Does Midas Hotel & Casino offer a smoking room? In compliance with Philippine Executive Order 26, all rooms are non-smoking. However, we have a designated smoking area located at the Casino mezzanine floor. Does Midas Hotel & Casino offer a handicapped room? Absolutely! Kindly let us know through the comments section of your online booking page or you can also call us to make a reservation (tel.) +63-2-902-0100. Can I order food in my room? Absolutely! We have an in-room dining menu in each room where you will be able to pick a wide-range of food and beverage that will satisfy your cravings. Can I bring outside food to my room? We do not allow outside food in our establishment due to liability and sanitary reasons but there will be a corkage fee for certain food/beverage items. What amenities can I expect in my room? How many extra beds can I get in my room? The maximum number of beds per room 1. This is upon request though and still needs to be confirmed by management. Extra charges apply. Can I store my luggage after checking out? Absolutely! Just simply head over to our receptionist for assistance. Can I request for an early check-in or late check-out? Yes, for late check-out’s you could inform any of our front office agents upon check-in or you could also indicate it on your online reservation form’s comment section. What time should I check-in/check-out? Check-in time is at 2:00PM and check-out time is at 12:00PM. Special requests regarding this matter can be made during or after booking. What are the facilities in Midas Hotel & Casino? Can I reserve the gym for a private event? In order to provide all of our guests with pleasurable experiences, we do not close off our gym for private occasions. Can I reserve the spa for a private occasion? Yes, with minimum number of persons and spa services availment required. Please contact us regarding this matter. Is there parking within the property? Absolutely! Parking is available at the hotel. Can I reserve a parking slot? Parking slots are on first come, first serve basis only. Does Midas Hotel & Casino offer valet parking services? Yes, valet parking is charged at Php 50. 20% Discount on Best Available Rate (BAR) for all room categories. 20% Discount on Buffet Breakfast at Midas Cafe for 2 persons for Executive Room complimentary stay only. Do my points have an expiration date? 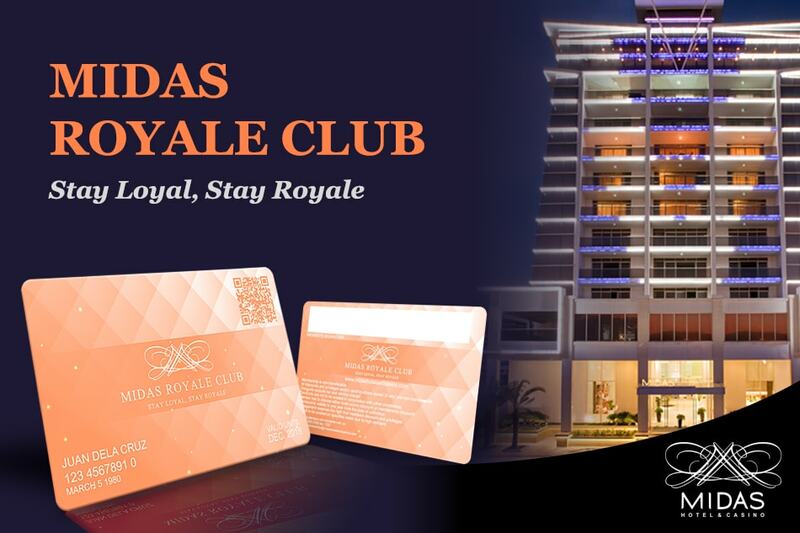 Midas Royale Club (MRC) points are valid until 2 months after expiration of membership. Is the account transferrable to my family members? Midas Royale Club (MRC) is not transferrable. What valid Government IDs can I use to sign-up/claim a membership card? Any valid government issued ID can we used to claim a membership card. I forgot my password/account number. What do I do? 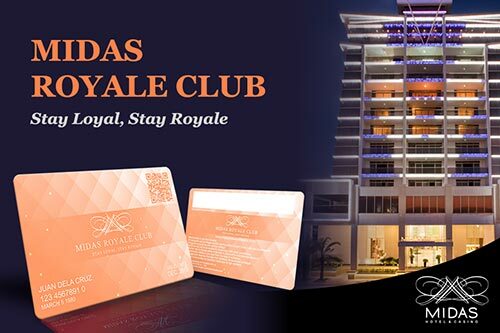 Please go to Midas Royale Club (MRC) membership portal. How can I check for my points? How do I book a meeting or an event in Midas Hotel & Casino? Can I change details of a previously reserved meeting or event? For any changes or cancellations, kindly contact us immediately. Terms & Conditions apply and are subject to change depending on signed agreement. The hotel is not responsible for the security safety of any valuables left in the guest rooms or public places as governed by the Civil Code of the Philippines. However, if such a fortuitous event occurs, you can approach any of our employees regarding this matter and we will do our best to help. All items found/given to our team will be handed over to the security personnel by the end of every shift. Please let us know 72 hours before the check-in date if you need to cancel – if we don’t hear from you, we’ll need to charge full amount of reservation on your credit card. Cancellation made (48) hours prior to expected arrival date are subject to cancellation fee equivalent to the total amount of the reservation. Use of third party credit card without bank approval does not guarantee your reservation and will be subject to automatic cancellation or release of reservation. We will not be able to refund you if you use DEBIT CARD. Thank you for understanding. Reservation must be guaranteed by a major credit card only at the time of booking. Use of DEBIT CARD is highly discouraged. Cards used will be charged within 72 hours prior to arrival. Use of third party credit card requires 7 days bank processing. Cardholder is required to provide authorization letter, copy of credit card and valid government issued ID. Please note that for security purposes, you will be asked to provide a valid government or state-issued photo ID at check-in. Check-in time 2 p.m. Check-out time 12 p.m.
Rates are quoted in Philippine Peso per room per night based on single or double occupancy. Room rates are inclusive of service charge and government taxes. Each room has a maximum capacity of 3 adults or 2 adults and 2 children below 12 years old. Extra person is chargeable at the Hotel’s rate. Check – in time is 14:00 hrs and check-out time is 12:00 noon. Extra Adult – Php1,500.00 will be charged per night . Inclusive of roll away bed and breakfast. Extra Child – Php1,500.00 will be charged per night . Inclusive of roll away bed and breakfast. Adult Rollaway – Php1,500.00 will be charged per night . Inclusive of roll away bed and breakfast. Child Rollaway – Php1,500.00 will be charged per night . Inclusive of roll away bed and breakfast. Service Charge – Rates are subject to 10% service charge. Additional Deposit Policy – An incidental deposit of Php3,000/night will be collected upon check-in.